Bassets are laid-back and are utterly devoted to their families, getting along with everyone, children and animals included. They are sweet, gentle, peaceful and naturally well-behaved. The only thing that really gets them excited is a good scent trail where they sometimes exhibit a deep musical bark. Bassets are more active than they look and need daily exercise. Basset Hounds usually weigh between 40 to 50 pounds and stand approximately 13 to 15 inches tall. They have a long, low, wrinkly, droopy, yet regal body. They have a medium-sized body with extremely short legs supporting a long, stout body. Their hair coat is short and colored in combinations of black, white, and tan. 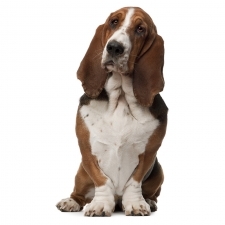 Basset Hounds are probably best known as the Hush Puppy dog. They are big dogs on short legs. Their short-legged appearance is the result of a form of dwarfism called achondroplasia. Despite their large size, they believe they’re a lap dog and will do their best to get in yours.